“The ‘Reading Only X Writers For A Year’ a challenge is one every person who loves to read (and who loves to write) should take. You could, like Lilit Marcus, read only books by women or, like Sunili Govinnage, read only books by people of color. Or you could choose a different axis to focus on: books by trans men and women, books by people from outside the U.S. or in translation, books by people with disabilities. Fellow Space Unicorns, we love lots about this idea! One of Uncanny’s founding principles is a deep investment in exploring all that SF/F has to offer, by finding stories that both evoke a sense of the familiar and seek out the unknown from authors with many different backgrounds. So in support of people taking this challenge, we’re offering a FREE COPY of our upcoming Issue Three to anyone who is taking up this challenge or simply broadening their reading. 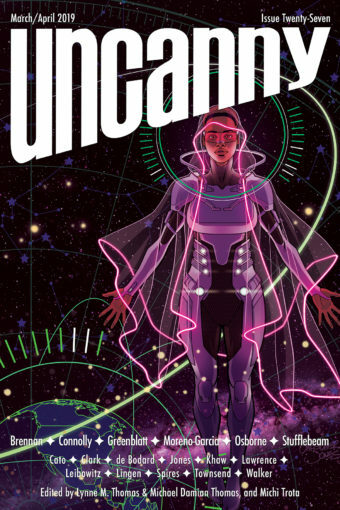 Uncanny Magazine Issue Three features new short stories by Sofia Samatar, Kat Howard, Maria Dahvana Headley, Sarah Pinsker, Emily Devenport, and Fran Wilde, classic fiction by Ellen Klages, essays by Ytasha L. Womack, Stephanie Zvan, Amal El–Mohtar, and L.M. Myles, poetry by C.S.E. Cooney, Jennifer Crow, and M Sereno, and interviews conducted by Deborah Stanish with Sofia Samatar, C.S.E. Cooney, and Ellen Klages. Issue Three is being released on March 3. Simply send us an email using our contact form telling us you’re taking the Bradford Challenge or some variation of it, and we’ll send you an eBook copy of Uncanny Magazine Issue Three (EPUB, MOBI, PDF). If you enjoy Issue 3, back issues and subscriptions are available from Weightless Books.